"Moon Lotus," "Kimono Blossom," and "Iris Waterfall"
Mochi Mochi Fiber Art is a collaboration between quilt designer Bergen Rose and painter Keiichi (Ted) Nishimura. Mochi Mochi Fiber Art's quilt patterns are fiber translations of Ted's paintings, inspired by Japanese artwork. Each 16" x 16" Asian-inspired art quilt pattern depicts a beautiful natural scene offset by a neutral print border. 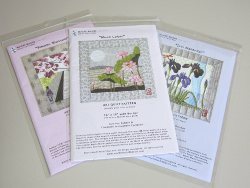 Cranes and flowers are common themes in Mochi Mochi Fiber Art quilt patterns. Most of the quilt designs are achieved with fusible appliques, making them accessible even to beginning quilters. Mochi Mochi Fiber Art quilt patterns provide a way for aspiring art quilters to experiment with fused art quilts without the pressure to create their own designs. With Mochi Mochi patterns, even your first art quilt will be beautiful enough to display in your home! Moon Lotus: This gorgeous 16" x 16" art quilt pattern celebrates the beauty of a lotus flower emerging from mud and water. A silvery moon and a faint mountain silhouette in the distance give the piece a broad sense of time and space. The background of sky and water in the quilt is pieced, while the flowers, moon, and other elements are appliqued. The pattern includes full-size templates for each applique. Iridescent bonding powder, silk, and tulle are suggested as additional embellishments to represent mist, fog, water, and clouds. Kimono Blossom: Piecework and applique combine to create a beautiful perspective in this scenic 16" x 16" art quilt pattern. Under the close-up splendor of a flowering tree, a stream and cobblestone path stretch into the horizon. A woman in a kimono walks along the path in the far left corner. The tree and woman are appliqued onto a pieced background that makes up the grass, path, stream, and sky. An ivory silk overlay is an optional addition to give the surface of the stream a realistic glimmer. This miniature quilt captures the essence of spring with its dark pink blossoms and bright green grass. Iris Waterfall: Mochi Mochi Fiber Art designed this miniature art quilt pattern to represent bravery. Irises are a symbol of courage, and they figure prominently in the 16" x 16" quilt. The lifelike irises are created with appliques against a pieced background. Decorative quilting on the background pieces helps to give the clouds, sky, and water extra character. A tiny red dragonfly applique provides a bold counterpoint to the cool colors in this art quilt. The pattern suggests a blue sheer overlay to give the waterfall added texture. Is there supposed to be a link to download these patterns? Hi Magginkat! This is actually a review of patterns for purchase. Head over to the Mochi Mochi Fiber Art website in order to buy them. Happy quilting! Saw this display of art at the Northwest Quilt show last week-photos do not do it justice-you must see the fabric and stitching. I am so sorry I had to rush off to classes and did not get any kits/patterns. These are gorgeous. Would be fun to quilt.